Herbivore Moon Fruit Review — Beauty and Etc. Over the past couple of months I’ve been really intrigued by the brand Herbivore. Recently I’ve been on a quest to incorporate products that contain cleaner ingredients. Herbivore is known for using non-toxic ingredients that are known to be effective. This brings me to the Herbivore Moon Fruit Super Fruit Night Treatment and my thoughts on it. Herbivore was founded by Julia Wills and Alexander Kummerow in 2011 in their Seattle kitchen and are created without the following: Synthetic ingredients, parabens, sodium laurel sulfate, phthalates, chemicals, fillers, animal testing, mineral oils and petroleum. Their products are made with natural ingredients, plant-based food-grade cold-pressed oils, steam distilled therapeutic-grade essential oils, GMO free soy wax, recyclable and reusable packaging, many certified organic ingredients. 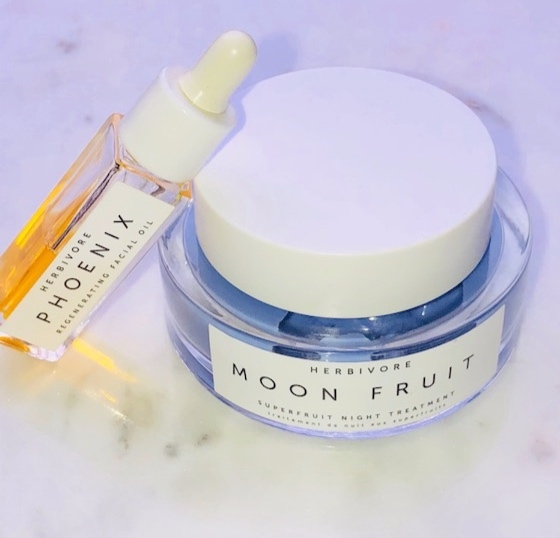 I acquired both the Moon Fruit Night Treatment and the Phoenix Oil by two of my generous beauty blogger friends. Both have tried the items only a few times and feel like they didn’t worked for them. I like to take challenges and was interested in trying out both of the products and wanted to see if I could figure out a way to make both products work for me. Product Description: For those that do know the Moon Fruit is a night treatment. I’ve seen many people refer and tried to use it as a mask, but its actually meant to be applied at night as a treatment and not to just sit on the surface on the skin as a mask. Moon Fruit as shown in the picture as a creamy purple texture. It’s meant to lightly exfoliate and improve uneven and dull textures. 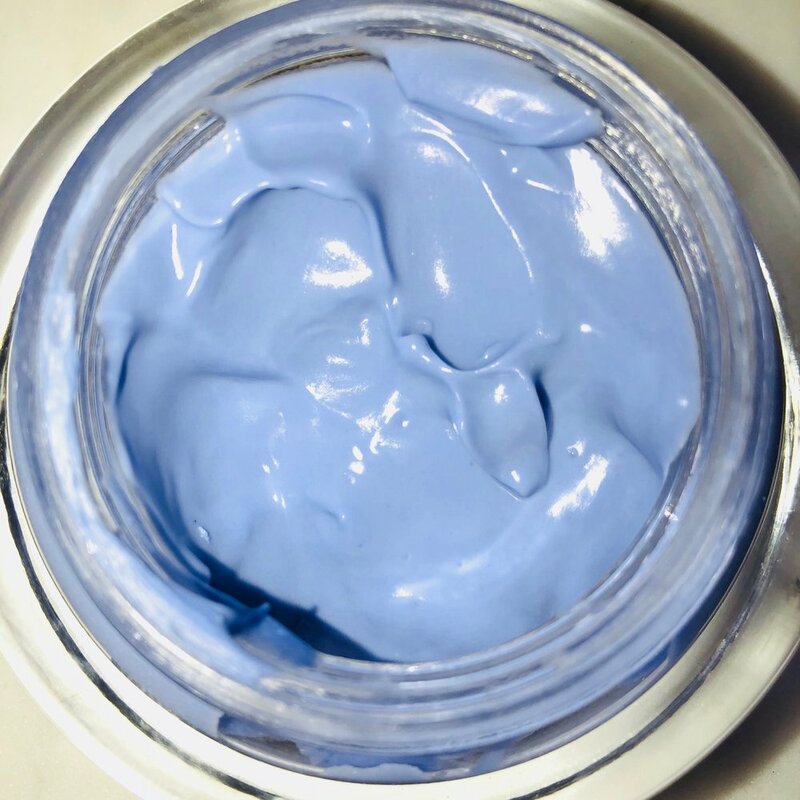 It’s formulated with super fruits, exotic butters and my favorite hyaluronic acid. The Moon Fruit Night Treatment is made with Fruit Enzymes/BHA’s and AHA’s; which provides exfoliating properties. What order do I use Moon Fruit in my routine? Cleanse -> Mist -> Mask (if it's a masking night), Moon Fruit -> Facial Oil. Cleanse -» Mask -» Toner -» Essence -» Moon Fruit Treatment -» Facial Oil (Phoenix) -» Eye Cream/Gel. I’ll admit it, it took me a several different routines and even reaching out to the Herbivore’s instagram rep before I finally found a routine and method of application that worked best for me. As per the instructions listed on the packing for Moon Fruit, do not use any serums prior to the treatment and to apply it on cleansed dry skin. When using the Moon Fruit Treatment I typically like to keep my routine simple and and free of any other active ingredients or acids. This gives me a better assurance that the ingredients of my other products (toners, treatments and moisturizers) will not interfere or counteract one another. The first time I tried using Moon Fruit I was bit confused based on the texture, which is very much of a butter/moisturizer. The first couple of uses I applied my cleaner, toner, essence and would use a serum/treatment prior to the Moon Fruit. I also would apply the Moon Fruit to my face and proceed to rub it in as if it were a regular moisturizer. Doing this I noticed that while I rubbed in the Moon Fruit it would start Pilling, which is basically when your skincare starts balling-up after it's applied. I reached out to the Herbivore Instagram one day and explained my problem. They answered my question very quickly and gave me some pointers on how to use Moon Fruit Treatment. Instructions: Moon Fruit is to be applied after toner (wait for it to set first) - meaning not wet skin. Press the product into the skin, rather than rubbing it in. Do not layer it with any other serums or moisturizers on top. If you feel like you need more moisture, tap into the skin a facial oil or a light moisturizer. After applying these steps to my routine I noticed that the application applied well and my problem of product pilling stopped occurring. Many people have described the scent of Moon Fruit as lavender and to be some what off-putting. But I don’t agree and I think it smells very much herbal. I don’t find that the scent lingers long enough for it to bother me. The buttery texture and the need to use very little product for each application means that the full size of 1.7 ounces will last a fair amount of time. After each application of the treatment along with using a 3 drops of the Phoenix Facial Oil, my face feels hydrated, smooth and glowing. I’ve notice that many hours later my face is NOT feeling oily nor looking greasy. I’m happy to say the combination of the Moon Fruit and the Phoenix oil to be a perfect blend for me. If I didn’t mention it before, my skin type is a combination of Normal to Oily. Now that it’s winter (cold dry air) where I’m located, I’m finding the need to add additional levels of moisture to my routine. I couldn't see myself using the Moon Fruit Night Treatment without an additional source of hydration from a facial oil or light hydrator. I find that this mixture leaves my skin looking and feeling balanced. Those who have dry and normal skin textures may not find the Moon Fruit treatment hydrating enough and will likely want to hydrate after using the treatment. Being that its a night treatment- I find myself using it 2-3 days out of the week and but not consecutive days. The nights that I’m not using an AHA like the moon fruit, I’m using a retinol treatment. As much as I like the Moon Fruit in conjunction of the Phoenix Oil there’s a few things that could be considered problematic and are on my radar. Application: As I mentioned before, I found the application to be quite difficult to use at first with the problem of the product pilling. Change in color and smell: Many of the reviews online have mentioned that the product changes in smell from a lavender to an earthy clay scent. Others have also mentioned that the color over time has changed in from a purple color to a pinkish color. I’m aware that that Herbivore is made with all natural ingredients, which leads me to the next point. Shelf Life: Products made with natural ingredients tend to have a shorter shelf life around 12 month (sometimes less). Products are recommended to be kept at room temperature or lower to stay fresher. TIP: Those who have a mini skincare fridge could benefit by keeping this product in the fridge to help keep it fresh for longer, especially in a warmer climate. Do I plan to re/purchase these items as they were gifted to me? As I mentioned, the Moon Fruit Treatment along with the Phoenix oils were gifted to me. Right now I think it’s too early for me to say if I would repurchase both items. I really do enjoy and look forward to using the Moon Fruit Treatment. My skin tolerates it well and is radiant after using it. I find the treatment to be quite mild. If you’ve used actives/acids like AHA’s in the past, you’re probably unlikely to have a bad reaction to the Moon Fruit. If you’re someone who is new to acids I can see this treatment as being a good start. Being that I like the results I would say yes. But due to some of the cons that I mentioned, especially the the change in color and smell over time, I feel like I’ll be able to formulate a better idea once I finish the product.